Winnemucca. As life long residents of Winnemucca, our full service floral department is committed to providing beautiful floral arrangements and the finest cut flowers, backed by service that is unparalleled. 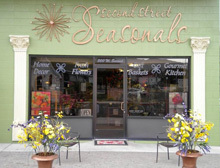 We offer a unique selection of fresh flowers, dish gardens, gourmet gift baskets, & custom silk designs. You will hear "OOH THEY ARE ABSOLUTLY GORGEOUS!" when you send an arrangement from Second Street Seasonals. We also offer an ever-changing collection of home decor, fashion accessories, baby items, gourmet foods & gift ideas. You'll be sure to find something for everyone. Because we know it is important to you and your loved ones, we try our best to accommodate special requests and late deliveries. If you can't stop by the shop go ahead, check out our website or even better yet call us at (775) 623-3456 and speak to one of our designers. Our flowers arrive daily and we'll make yours special, just for you! !